First, links to a few reviews of a cookbook with only 50 recipes, but that serves a good purpose PLUS the recipes look pretty good. Much of the attention has been focused on the cookbook’s status as the Duchess of Sussex’s first big splash for charity. It looks like a good fit. Last week, the Duchess of Sussex, who is perhaps still better known as Meghan Markle, made her début as an author and as a royal patron with the public launch of “Together: Our Community Cookbook.” This volume, an instant best-seller on Amazon, is a collection of recipes gathered by women whose families lived in Grenfell Tower, the West London high-rise where, in the summer of 2017, seventy-two residents died because of a disastrous fire. 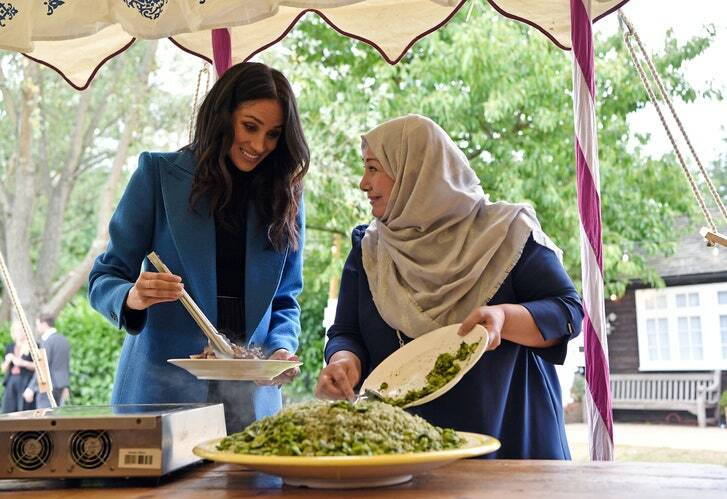 Markle began making off-the-radar visits to the Al Manaar mosque, which serves as a community center for displaced residents, last winter, and upon discovering that a kitchen formed by the women of Grenfell—known as Hubb, the Arabic word for “love”—was only operational two days a week for lack of funds, proposed making a cookbook as a fund-raiser. The book, the production of which is Markle’s first substantial charitable undertaking since her marriageto Prince Harry, earlier this year, was launched with a garden party held at Kensington Palace, the couple’s present home, which lies a couple of miles south of Grenfell. Princess Diana learned on the job the tremendous influence that a well-chosen charitable gesture can have: her willingness, at the height of the aids crisis, in the late eighties and early nineties, to embrace and shake hands, glove-free, with patients sick with symptoms caused by H.I.V. was widely regarded as having helped to lessen the stigma of the disease at a time when public fear of aidspatients was widespread. Markle’s gesture toward the women of the Hubb Kitchen suggests a mature, considered consciousness of the potential power she holds in speaking to, and for, members of the British public who are in danger of being marginalized. The cookbook introduces each recipe with a brief note from the woman who contributed it, such as Ahlam Saeid, who earned a master’s degree in chemistry in her native Iraq, from which her recipe for green rice originates, or Lillian Olwa, whose recipe is for chapatis like those she ate while growing up in Uganda, and who took up cooking in the wake of the Grenfell fire, after growing tired of eating packaged food while living in temporary accommodation—Londoners both. As a new Londoner herself, Markle may find other subtle ways to speak for the sixty per cent of the city’s residents who voted against Brexit, it being plainly against the spirit and interests of the capital city to cut itself off from Europe or beyond. And, as the Duchess of Sussex, perhaps she will also find ways to speak to the razor-thin majority that—in the county from which her title derives, as in the country at large—voted in favor of a less international Britain. Let’s hope she does; it certainly looks like she’s got the appetite.